Black Diamond's second stint as a high-end premium product is now upon us. Just like last year, each 'box' of Black Diamond contains just a handful of cards. Collectors will find one thick pack of Black Diamond cards and a pack containing a single Exquisite card when they open up their box. At release, boxes of this product are around $200 USD. That's a steep price! Let's see how this year's iteration looks and if it is worth that high price tag. The base cards in Black Diamond have a very nice look to them. They are not on super-thick stock, but the elements of the base cards are well-done. Each card is serial numbered to 249 and is adorned with foil. Most of the card is well-balanced save for the large team logo beneath the player image. It's obvious that there are parallel cards of the base set and that spot is meant for an autograph or memorabilia piece. It's convenient for companies to do this as it makes card design easier, but I'd rather the base cards be more unique. For me, this design choice just tells me that this is the basic version of better cards. Though I don't particularly like it, it's not too egregious of an offense. My favorite part of the base card has to be the card edge. I know, it's weird to say that, but the Black Diamond edges are so sweet! The edge is layered like a three part sandwich. 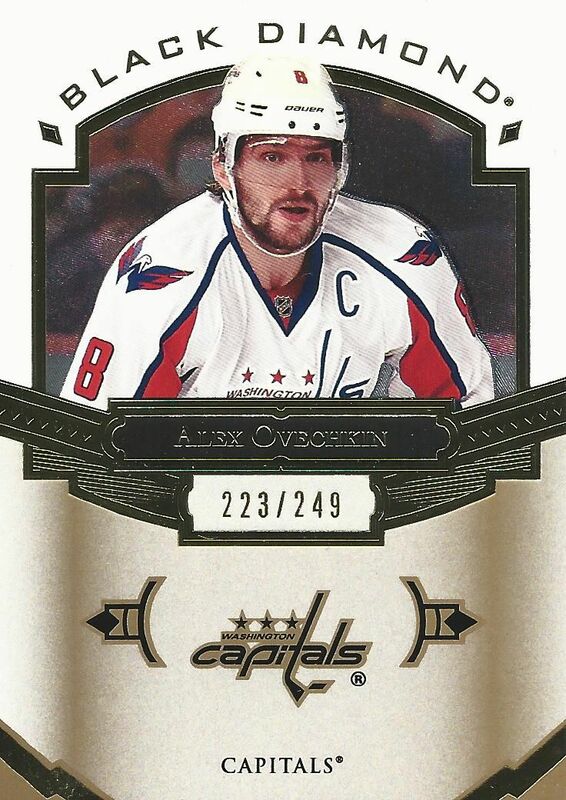 Upper Deck has done this before with Black Diamond and it is a great premium touch. I prefer this to the all white giant stock of base cards from The Cup. The back of the base cards have a well thought out look that is anything but generic. The angles used, especially around the player image is very nice looking and there are plenty of colors to make the back look engaging. Black Diamond has always been one of Upper Deck's more stylish brands, and I feel that these card backs do the brand justice. 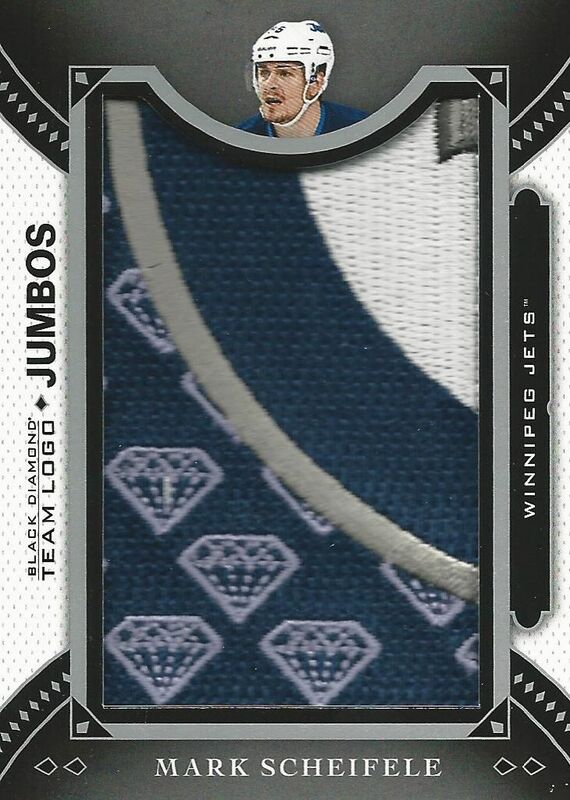 Rookie cards in Black Diamond take on the single, double, triple, and quad diamond configuration as in years past. Unlike years past, however, getting a rookie card is very tough. Each of these cards has a gem embedded in it. Though I didn't pull on in my box, the cards look great from what I have seen. They have a mainly white color scheme that works very well with the diamond, upper-end motif. Now that Black Diamond has gotten to upper echelon status, collectors expect hits when they open up the product. 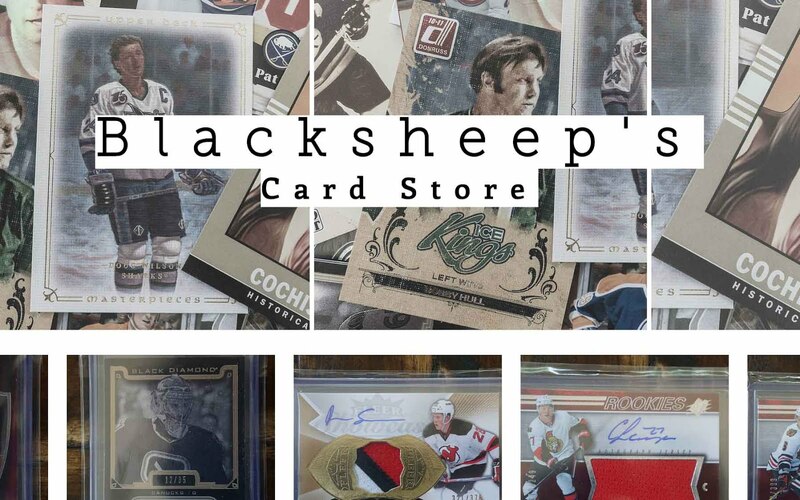 Black Diamond delivers autographs and memorabilia cards alongside cards that contain gems. Also in this set are manufactured patch cards and premium insert cards. 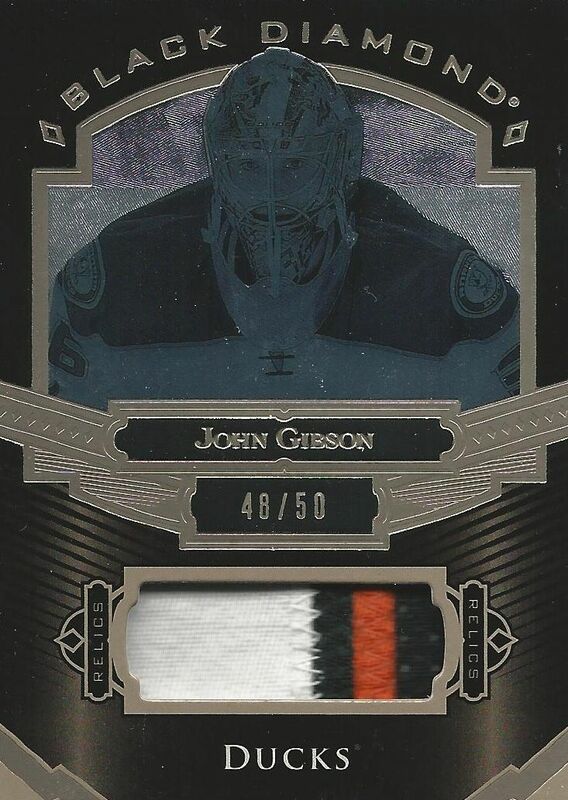 The one game-used patch card to come out of my box was this John Gibson card numbered to 50. I think this card looks very different than the regular base card, but if you put them side-to-side for comparison, you'll notice that they are the same - save for the patch piece and the black background. The patch piece is medium-small but a quality cut. The foil for the player image is nice and the card is on very thick stock - it is certainly premium - but I doubt this card will be very desirable except to the most die hard of Duck fans. This Scheifele card looks like it would be a sick patch... but it's not. Upper Deck did this last year as well. The patch on this card is manufactured and are intended to be a puzzle that you can put together. Cards like this may appeal to some, but I think for most people they are a let down. I'd just as well not have these cards in the set. When paying upwards of two hundred dollars I want the real deal. This manufactured stuff just doesn't belong. 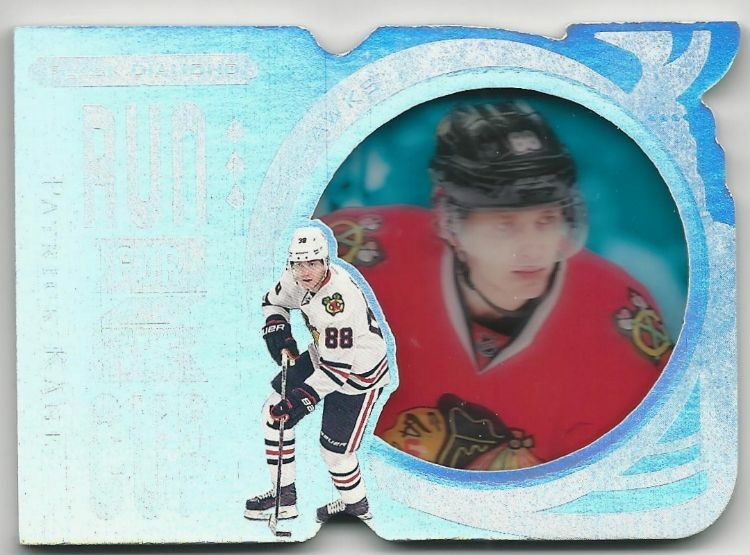 An interesting card that came out of the box was this Patrick Kane Run for the Cup insert card. I'd call this a premium insert as it is very thick, contains a lot of foil, and is numbered to just 99. It looks like Upper Deck put a lot of insert tech into this card as it also has acetate and a layered edge along with what I already mentioned. This is a sweet looking card, but I do have to ask myself again if I'd rather have something like this or an autograph. Unless the collector market deems these highly sought after, I think I'd rather have an auto (or at least a patch!). My Exquisite pack got me a nice Rookie Draft Day card of Auston Matthews. I consider this the best card out of my box. It's not autographed, but at least it's of one of the top rookies so far this year. I do like the fact that it is an Exquisite card as well. I love that brand and am glad we in hockey collecting get to finally get some these past few years. Sadly, my autograph card was a redemption card so I don't know what it looks like. There are a lot of different types of cards you can find in Black Diamond this year. Books are available as are other types of manufactured patches. There is a huge mix of content that really would take a close inspection of the checklist to get a good handle of what is available. The cards in Black Diamond this year look pretty spectacular. I found myself really enjoying them and oogling over the way they looked and felt. What disappointed me about the cards were the value that was in the box. Sure, purchasing hockey cards will rarely net you back what you purchase in sealed products, but I just didn't think much value at all came out of the box - certainly not for north of $200. The product contains too many manufactured items and not enough of what collectors want: autographs and hits. I wouldn't be surprised if the price of Black Diamond drops by quite a bit in the future. For it to be worth it the boxes need to take a significant dip. I suggest waiting if you want to try Black Diamond. For this sophomore edition of the 'new' Black Diamond format, I think Upper Deck still has to tweak the product to get it right. I do like that Black Diamond is a premium product, it's just that it needs to be packed with cards that collectors find worthwhile in an upper-end brand. Not a huge fan of Black Diamond new or old..great review as always! 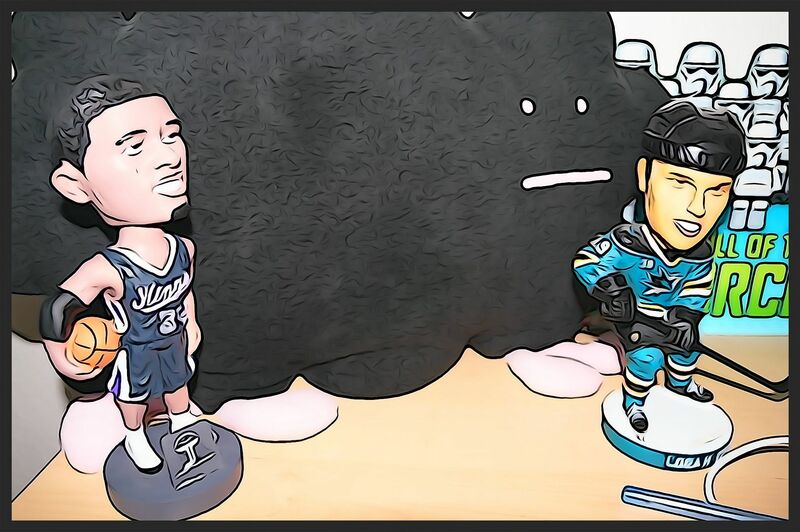 Hockeyvlogger24 i love the one pack idea but nog when they ruined black diamond what are they going to do next will they make series 1 a one pack box?????? + The Gibson card looks pretty cool. + Nice touch with the Exquisite pack. - Too few, and bad, hits for a product like this. The cards look pretty good! Nice Scheifele but too bad it's a manufactured patch, I don't care for those.. Sick Gibson patch though! I'm a fan of the new "era" of black diamond rather than the retail version of it in years past, I never seemed to get much out of the retail version. Nice review. Have to agree with you about the manufactured patch. Awesome Matthews though. I Agree with your review. Meh product. 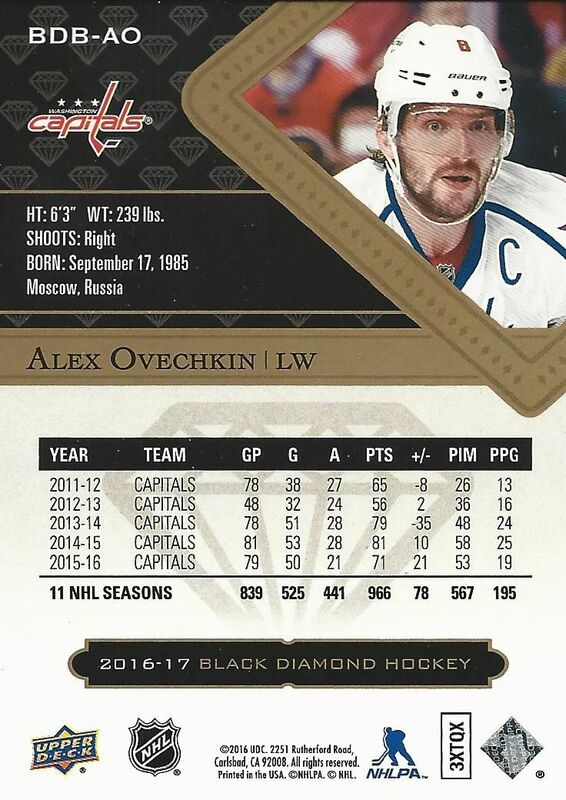 Haven't seen too many of the other 16-17 Black Diamond breaks yet but that was certainly not worth the price point. A few decent cards, Luke, which is nice to see given your contributions to the collecting world. Would have been nice to see you pull something big. Great review as always! But not a great product. Higher prices but not higher value. Seems to be a common theme with UD. Thanks! I really liked the way the cards looked this year. Im still not thrilled about how it changed to an expensive break last year. Great review! Without the Matthews doesn't seem necessarily worth the money but overall a decent haul. I actually like the Scheiffele patch however the diamonds kinda ruin it. Great review as always. Your insights are always appreciated when looking at new product. I agree not getting your money worth. Not worth the money they're asking. No many hockey boxes are worth the gamble these days. Ahoy there, thanks for the review of UD Black Diamond. They should price this around $90 max, not $200+. The bonus pack was sweet but the other cards are "meh". Keep up the good work! Rough break. 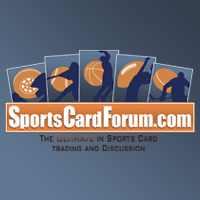 There is just way too much confusion among Upper Deck's different products and not enough differentiation. What's the point of Black Diamond being a premium product if it can't compete with the likes of Trilogy, SP Game Used, Black, and SPx in terms of design and game used and autograph materials. This years Balck Diamond inserts I would say are not the best, but I have to agree that the base card design is sharp and clean. Great review man! Nice Matthews! Im not that big of a fan of the base design and jersey design. Not worth 200$ Maybe 100. Nice Matthews! Not worth 200$. Nice Kane card tho. Not a fan of the base design. I agree with you that this is a terrible product. One auto? Come on ud. Give me a break! Who can afford the price but a few! Upper deck is killing the hobby. It is totally oriented towards group break and only a few can afford the price for the best teams, Shame on you U.D. Nice review. I like that Black Diamond stepped up there game. I never really liked black diamond but the hits look nice! I personally think it absolutely crazy that your you got a manufactured patch out of a box that you spent over 200 dollars on. Making Black Diamond a high-end product is a good idea (fits well with the 'image' of its name), but the choice of the cards inserted weren't as good of an idea. That said, awesome break! you are so lucky to get that sick Matthews! I tend to agree with you. While the product is nice, the price point is a bit steep for what you get. Enjoyed your product review. 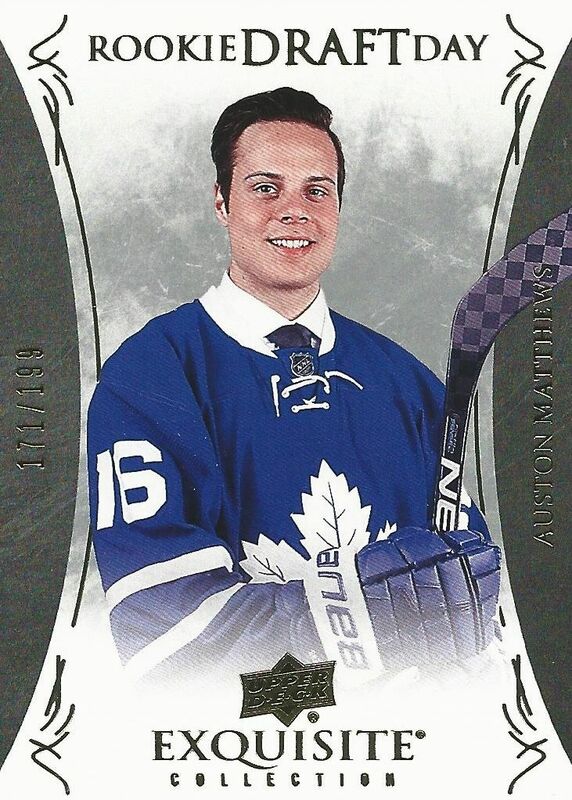 Would sure love to win that Matthews card for my Leafs collection! Youtube is "paddleboatangler"
Nice break! Love the Matthews!!!! I don't have a YouTube account but I've seen your YouTube on the 2016-2017 black Diamond box of cards ,first time looking at theis cards and I like them a lot but they should have put more cards together in a box then what they have .I am a big Toronto Maple leafs fan since I was 3 years old and my favorite hockey player is David Keon , now since Toronto Maple leafs have some Rookies on the team that put them in the playoffs and I'm a big fan now of Awsten , Mitch , William , Brown , Hyman , and so on . Go Leafs Go my email address is kr1leaffan@gmail.com please send a message thanks also it would be nice to win a box because I'm just starting to get into collecting cards I have 101 set of 1992 tribute to the 1972 summit and they are in mint condition thanks Ken Ridout a true Leaf Fan forever.